This is another film that was re-release to show in 3D. 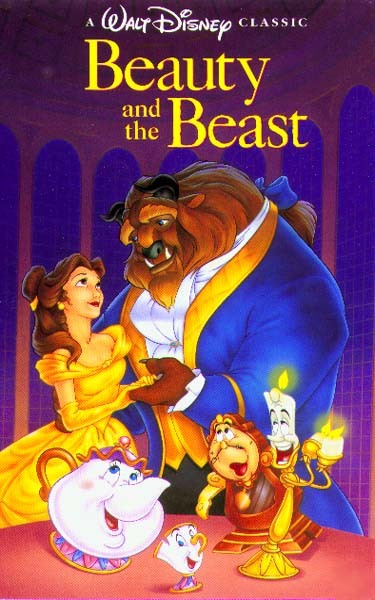 Beauty & the Beast was 1st shown in cinemas in 1991. It was a film that is dear to my heart because this was the first movie ever that I watched on the big screen. Back then, I was in Ipoh and my father with his want to bond with me (I was drifting more and more apart from my family back then) brought me to Cathay cinema located right in the heart of Ipoh town (which is now no more of course) to watch this film. Somehow, I remember watching this in 1993 though, when I was 13 years old. Hmmm. Did I recall incorrectly? Cause, when I started going to high school, that was the time that I drifted apart from my family. Anyway, at 1st, I didn't quite like the idea of my father bringing me to the movie theater because I felt it was a waste of money and time when eventually I will be able to watch it on TV (inherited this type of thinking from my family). Along with that thought, I also didn't quite like the idea of him bringing me to watch Beauty and the Beast which I felt quite a sissy to watch this and 3rdly, I abhor the thought of spending time with only my father. Well, needless to say after that experience of watching this movie, I loved watching movies on the big screen. Many a times, I went to the movies to watch after school even though, sometimes I'll be watching alone (which I didn't mind) if I'm not spending time at the arcades or bowling. The very show that I thought was girlish and childish to watch (because of it being of a romance nature and a cartoon) turned out to be one of my all-time favorite show. It really brought out the emotions in me where for the 1st time, I actually cried watching a movie (can't remember any other show who did that to me when I'm in theaters) and also instilled the love of watching movies at cinemas. The show Beauty and the Beast starts off with the narration of the introduction of a young prince who lived in a castle where he turned away an old haggard looking beggar seeking shelter on a stormy night due to her appearance. As a result of this, the beggar transformed herself into her original form which is a beautiful enchantress and put a curse on the young prince and all that lived in the castle. The prince turned into a hideous beast while the rest of the people who lived in the castle turned into items. The prince only hope of recovering everything to it's former glory was to find true love and to be loved in return before the last petal on an enchanted rose falls. Otherwise, they shall be remained cursed forever. Years later, at a small little village, lives a beautiful girl by the name of Belle with his inventor father, Maurice. She longs for adventure instead of the mundane, everyday life at the village. Her beauty has caught the attention of the arrogant, local hero, Gaston, who set out to marry her. One day, Maurice was taking his invention to an inventor's fair but got lost along the way. Running away from a pack of wolves, he ended up in the Beast's castle where he was taken as prisoner. The horse that was carrying Maurice, ended up back in the village to alert Belle of her father's predicament. Belle traveled on the horse to find back her father. She negotiated with the Beast to take her as his prisoner instead of her father. The Beast's intention was to have her to be the one to break the curse but his harshness and Belle's stubbornness has made it very difficult. Pretty soon, Belle couldn't stand and despite her promise to stay in the castle, she tried to runaway. However, she got entangled with a pack of wolves and that's where the Beast rescued her. Seeing this, Belle carried the exhausted Beast with the help of her horse back to the castle. Back at the town, Maurice was trying to convince the townspeople that his daughter was captured by the Beast but the townspeople merely laughed at him and thought that he was crazy. Gaston took this opportunity to lock Maurice up in a mental institution unless Belle agrees to marry him. Later on, the relationship between Belle and the Beast started to get better. The Beast saw that Belle misses her father very much and couldn't bear to keep her away from her father so he set her free to her father. Before she went away, the Beast gave her a magic mirror where the enchantress had gave him to be the window to the outside world so that Belle can gaze into the mirror to see the Beast whenever she wants to. Belle arrived just in time to prevent her father from being locked up and showed the townspeople with the magic mirror that there is actually a beast. The townspeople, pushed on by Gaston, was afraid that the beast will pose a danger to them. Hence, they march to the Beast's castle to kill him. For the ending of the story, watch the movie! But of course, you know, like any fairy tale, this has a happy ending. As mentioned earlier, this is one of my all-time fave movie. So to rate the movie based on past experience only would certainly be unfair since I'm very biased towards it. So what I'm gonna rate it on is how much wow factor has the 3D brought to this movie and whether it's worth watching in 3D. The 3D effects are definitely noticeable and it does immerse you into the environment even though it's an animation. I particularly like the snow effects where it does feel like it's all around you. It certainly has enhance the movie to a better version unlike the Star Wars re-release that I've watched earlier this month which was quite disappointing. And so I rate this 3.5 stars out of 5. Definitely worth to watch it once in 3D. It's one of my fave!